When Barack Obama and Hillary Clinton spoke of their admiration for radical socialst/anarchist Saul Alinksy the right took notice and not only educated themselves about ‘Rules for Radicals’, but seized upon them as an effective strategy to beat the left at their own game. The examples of this, primarily the deployment of Rule #5, “Ridicule is our most powerful weapon”, are widely used throughout the blogosphere, on Facebook and Twitter. Even this blog has embraced Rule #5 with gusto. When the Obama campaign tried to make an issue of Mitt Romney putting his dog in a crate on the roof of his car on Twitter, the right instantly responded with a counter assault focusing on Obama’s admission of the eating of dog when he lived in Indonesia. It was legendary. The best one was iMaksim’s “I’d rather be traveling on Mitt’s roof than through Obama’s colon’. But the dog recipes on Twitter were also epic. Every Twitter launch, every messaging launch, every word spoken by the president is met with withering fire and tremendous shock and awe humor. It’s fantastic. When Obama launches a new Twitter campaign there are infinitely more people mocking it than supporting it. It seems that whatever the left does these days is met with well coordinated responses by truly brilliant players. That’s not unexpected. The people on the right are infinitely smarter than their counterparts. Now. Onto my somewhat awkward seque. Or pivot. Can we all agree that Time Magazine is a leftist periodical? Yes. I think that we can. 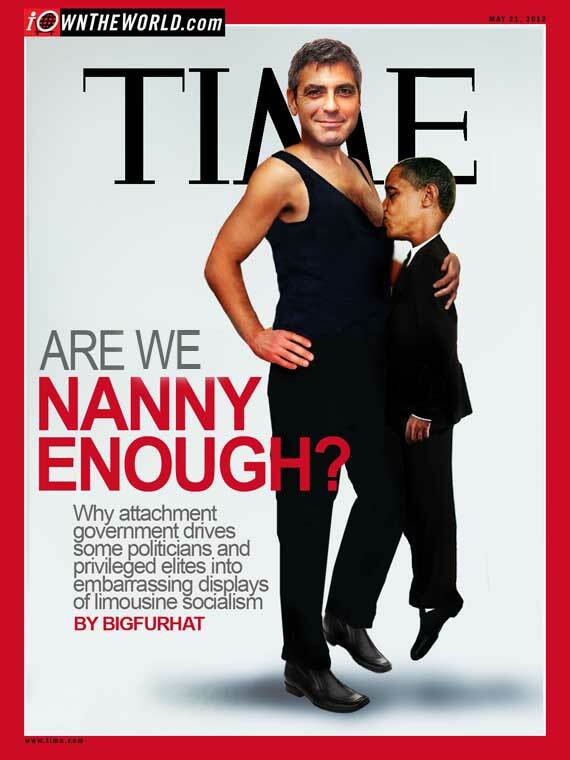 As you’ve no doubt heard, Time’s latest cover featuring a bizarre breast feeding photo with a kid that looks…Ahem….just a bit too old to be breast fed, is stirring up some controversy. I’m not even sure what the article is speaking about, nor do I care. It’s obviously a ploy to sell magazines to perverts, or something. But the blogosphere has once again Rule 5-ed them in a spectacular fashion. I can’t decide which cover of the cover from Big Fur Hat over at I Own the World I like best. I’m only going to show you one of them so as to force you over to IOW’s site. But I think this one is my fave. Good stuff, Big Fur Hat! Somebody needs to buy some billboard space and plaster this across the country.